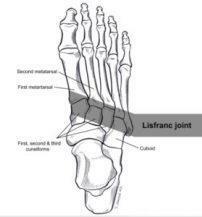 The Lisfranc joint is the point at which the metatarsal bones (long bones that lead up to the toes) and the tarsal bones (bones in the arch) connect. The Lisfranc ligament is a tough band of tissue that joins two of these bones. It is important for maintaining proper alignment and strength of this joint. Injuries to the Lisfranc joint most commonly occur in automobile accident victims, military personnel, runners, horseback riders, football players, and participants of other contact sports. Lisfranc injuries occur as a result of direct or indirect forces to the foot.A direct force often involves something heavy falling on the foot. Indirect force commonly involves twisting the foot. This can happen, for example, when the foot catches on a stirrup while falling from a horse. Sprains. The Lisfranc ligament, as well as other ligaments on the bottom of the midfoot, are stronger than the ligaments on the top of the midfoot. Therefore, when they are weakened through a sprain (a stretching of the ligament), patients experience instability of the joint in the middle of the foot. Fractures.A break in a bone in the Lisfranc joint can be either an avulsion fracture (a small piece of bone is pulled off) or a break through the bone or bones of the midfoot. Bruising or blistering on the arch—this is an important sign of a Lisfranc injury. Bruising may also occur on the top of the foot. Lisfranc injuries are sometimes mistaken for ankle sprains, making the diagnostic process very important. To arrive at a diagnosis, the foot and ankle surgeon will ask how the injury occurred. The surgeon will examine the foot and determine the severity of the injury. X-rays and other imaging studies—such as a CT or MRI—may be necessary to fully evaluate the extent of the injury. The surgeon may also perform an additional examination while the patient is under anesthesia to further evaluate a fracture or weakening of the joint and surrounding bones. Physical therapy.After the swelling and pain have subsided, physical therapy may be prescribed. Surgery. Certain types of Lisfranc injuries require surgery. The foot and ankle surgeon will determine the type of procedure that is best suited to the individual patient. Some injuries of this type may require emergency surgery. Complications can and often do arise following Lisfranc injuries.A possible early complication following the injury is compartment syndrome, in which pressure builds up within the tissues of the foot, requiring immediate surgery to prevent tissue damage. A build-up of pressure could damage the nerves, blood vessels, and muscles in the foot. Arthritis and problems with foot alignment may develop. In most cases, arthritis develops several months or longer following a Lisfranc injury, requiring additional treatment.